Don’t miss part two of Michael Upchurch’s write-ups for Crosscut on smaller installations now on view at SAM: this week, he highlights New Topographics, featuring photographs of “man-altered landscapes,” and American Modernism, which includes two incredible paintings from SAM’s collection by Georgia O’Keeffe and Marsden Hartley. The fall edition of The Stranger’s Art & Performance Quarterly is out! Lots of SAM shows and events are among their critics’ recommendations, including the exhibitions Peacock in the Desert and Noble Splendor, the annual Diwali Ball, and film events Night Heat: The 41st Film Noir Series and Indian Film Masterpiece: The Apu Trilogy. Sarah Anne Lloyd of Curbed Seattle tracks the important news of the Mystery Coke Machine’s sudden public appearances following its recent Capitol Hill dislocation. Seattle poet Quenton Baker’s Ballast opens at the Frye Art Museum on October 6; Seattle Met’s Stefan Milne interviews Baker about his erasure poems examining the 1841 revolt aboard the Creole slave ship. Brangien Davis of Crosscut interviews surgical nurse and artist Andrea Gahl about the doctor portraits lining UW’s surgical department hallway—and her new portraits that combat stereotypes about what a surgeon looks like. TIME Magazine highlights “31 People Who Are Changing the South,” including Bryan Stevenson of the National Memorial for Peace and Justice and Christy Coleman of the American Civil War Museum. Artnet’s Caroline Goldstein with a round-up of the best and worst of the art world this week, including the discovery of hidden treasure (best) and an eye-popping restoration fail (worst). The New York Times’ Holland Cotter reviews Soul of a Nation: Art in the Age of Black Power, which opens today at the Brooklyn Museum and explores expanding definitions of “black” art. Finally some genius made the Pizza Patio Set. Image: Installation view of New Topographics at Seattle Art Museum, 2018, photo: Stephanie Fink. There is something peculiar about the way we attribute the clarity of some photographs to the world itself. I try to reinforce that paradox by making photographs that convince the viewer that those revelations, that order, that potential for meaning, are coming from the world and not the photograph. Though Jenkins felt otherwise, one could certainly argue that Gohlke’s Aerial View, Tulsa, Oklahoma is in fact a beautiful and emotive image. Sure, it is far from the Platonic ideal of nature, but the photograph’s composition—with its nested and overlapping arcs, dramatic shadows, and abstract patterning—contains within it a certain beauty. It might not be Ansel Adams’s Half Dome, but it is a photograph that elevates otherwise banal and unattractive subject matter, poetically calling attention to man’s impact on the natural world. Importantly, Gohlke and his New Topographics cohort reinforced the notion of landscape as a manmade concept. It is a word and idea predicated on a human subject who turns the land into an object and, artistically, into an image. The very definition of the word hinges on an aestheticized understanding of nature. In Aerial View, Tulsa, Oklahoma, Gohlke deftly mobilizes photography to highlight the extent to which the landscape is indeed a manmade image, as well as an object—or resource—to be taken and transformed. The “new” American topography on offer in 1975’s New Topographics was no longer unspoiled or pristine wilderness, but a country comprised of suburban sprawl, connecting interstates, and parking lots. Whether or not we find that beautiful is up to us to decide. Luckily, this work and others from SAM’s permanent collection are on view in the upcoming New Topographics exhibition on view in the third floor Modern and Contemporary Galleries. 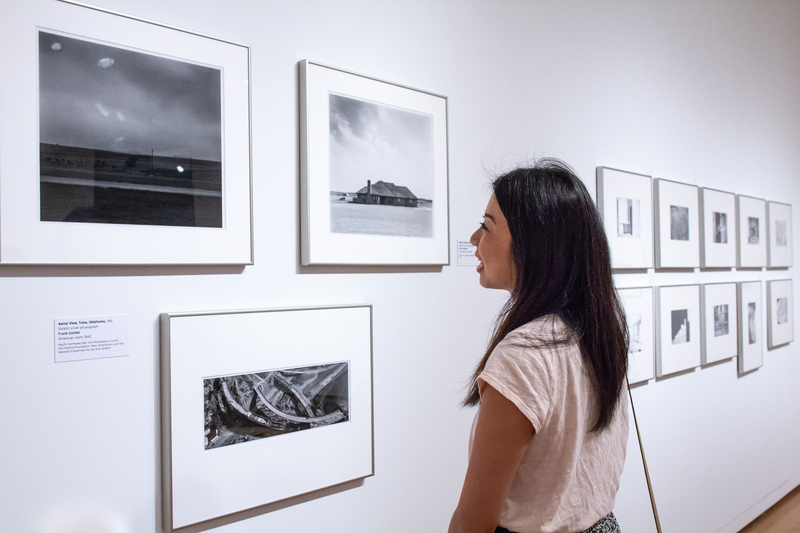 The other artists featured in the exhibition were Robert Adams, Lewis Baltz, Joe Deal, Nicholas Nixon, John Schott, Stephen Shore, Henry Wessel, Jr., and Bernd and Hilla Becher. William Jenkins, New Topographics: Photographs of a Man-Altered Landscape (Rochester, New York: International Museum of Photography at the George Eastman House, 1975), n.p.